With our heavy and medium-duty truck towing fleet we can produce over 100 tons of pulling and lifting power. Extracting vehicles and equipment from insurmountable obstacles is our specialty. 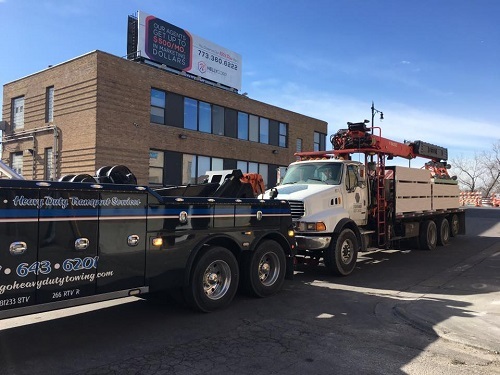 When you call Illinois Towing Service, Inc. you will be directly connected to the truck tow operator that is going to help you. This way you can explain the situation and get everything you need in no time at all. With our expertise and time-saving tips, we can get the job done faster and more efficiently to save you or your company money. That’s the bottom line. You can throw anything at us from large heavy equipment and machinery to small box vans and semi tractor/trailers. We look forward to helping you any time! Illinois Towing Service, Inc. is equipped to tow and service all medium or heavy duty vehicles providing within the 48 states. We provide expert heavy duty truck towing across all Chicagoland. We have the heavy duty tow trucks and equipment to handle any vehicle including semis, buses, RVs, tractor/trailers and heavy construction equipment. Call our family owned business and let our 20 plus years of heavy duty recovery help you @ (847) 966-1920.